Next week's teacher, Venerable Jian Sou, abbess of Dharma Jewel Monastery, has noted she will not prepare a formal lecture, but rather, will facilitate discussion or host Q&A. If you have any questions, feel free to email us in advance, or remember to ask them on Thursday! See you all on July 7, Thursday, at 6pm in Cannon Chapel 106. Also, join the birthday celebration this Sunday July 3, at Drepung Loseling Monastery, Atlanta's Tibetan Buddhist temple. His Holiness the Dalai Lama is turning 81! If you need a ride, let us know, Kat will be able to help coordinate! 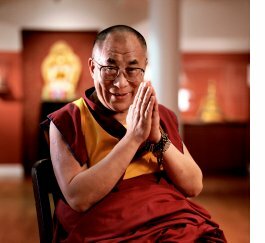 [http://media.jbanetwork.com/image/cache/1/7/3/6/6/9/6_w250_h243_s1_PR15_PCffffff.jpg]Join us for a day of celebration as we observe the 81st birthday for His Holiness the Dalai Lama! His actual birthday will be on July 6, 2016. We'll begin the day with the Long Life Offering Puja and finish with friends and family around tables filled with food. Please bring a dish to share.